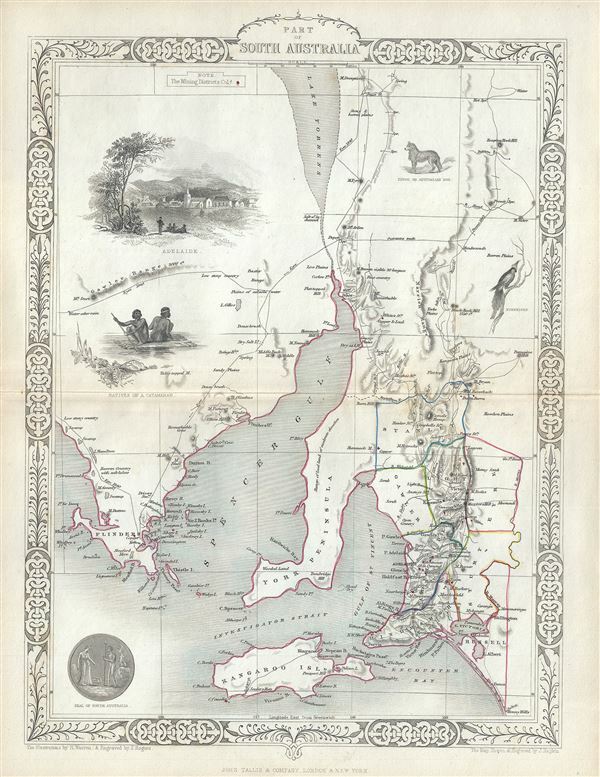 This is a beautiful example of John Tallis and John Rapkin's 1851 map of South Australia, Australia. Centered on the Spencer Gulf, it covers the southeastern part of the state of South Australia from Lake Torrens to Kangaroo Island and Bonny Wells. This map depicts the area during the early years of settlement in the only state to be settled by free settlers. The map includes beautiful illustration by H. Warren depicting Adelaide, natives of Catamaran, a Nymphicus, and an Australian dog. The seal of South Australia is also illustrated. Mining districts are depicted with red dots throughout. The map also notes the routes of the English explorer Edward John Eyre in 1840. The whole has the highly decorative presentation and elaborate border distinctive of Tallis maps. This map was issued as part of the 1851 edition of John Tallis and Company's The Illustrated Atlas, And Modern History of the World. John Tallis and Company published views, maps and Atlases in London from roughly 1838 to 1851. The principal works, expanding upon the earlier works of Cary and Arrowsmith, include an 1838 collection of London Street Views and the 1849 Illustrated Atlas of the World. His principle engraver was John Rapkin, whose name and decorative vignettes appear on most Tallis & Co. maps. Due to the decorative style of Rapkin's work, many regard Tallis maps as the last bastion of English decorative cartography in the 19th century. Though most Tallis maps were originally issued uncolored, it was not uncommon for 19th century libraries to commission colorists to "complete" the atlas. The London Printing and publishing Company of London and New York bought the rights for many Tallis maps in 1850 and continued Publishing his Illustrated Atlas of the World until the mid 1850s. Specific Tallis maps later appeared in innumerable mid to late 19th century publications as illustrations and appendices. Tallis, J. and F., The Illustrated Atlas, And Modern History Of The World Geographical, Political, Commercial & Statistical, 1851. Very good. Minor wear along original centerfold. Minor spotting. Blank on verso. Rumsey 0466.054. Phillips (Atlases) 804.